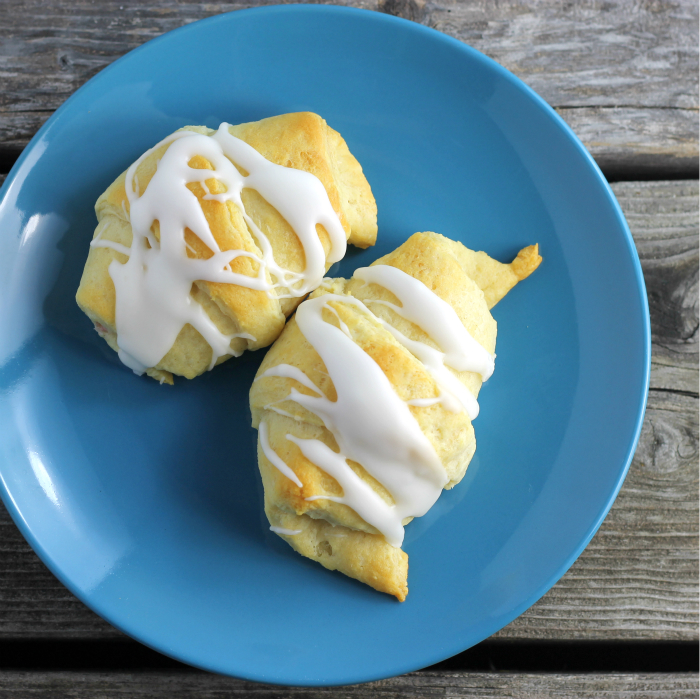 You are going to love these strawberry cream cheese filled crescent rolls. I am super excited about this post today. It’s one of those easy peasy recipes that everyone will fall in love with. Strawberry cream cheese filled crescent rolls, just typing this makes me wish I was eating one right now. Hey, by the way, did you know that it is Pi day today? I totally forgot about until I walked into the office and one of my co-workers said that he brought in a pie for Pi day. I think that this is a fun food holiday. Do you make pie on Pi day? Sorry for the distraction, but sometimes things just pop into my head and I have to get them out. Back to these strawberry cream cheese filled crescent rolls. I had made a strawberry cream cheese filling for a strudel that I made a few weeks ago, but the strudel didn’t bake up pretty, so I didn’t share it. This strawberry cream cheese filling has been on my mind ever since the strudel. When Mike and I were doing our weekly grocery shopping I spotted the crescent rolls in the refrigerator section. The cream cheese filling popped into my mind, so I picked up a can. To be honest I was a bit nervous when I was making the crescent rolls. I had visions of my strudel and I was hoping the end result wouldn’t be a disastrous mess like the strudel. When the timer went off on the oven and I opened the oven door I was surprised by how wonderful the crescent rolls looked. The filling stayed in the rolls and they looked scrumptious. I let them cool and drizzled lemon icing over top. It was love at first bite. Looking for something easy peasy, but super yummy to impress your family with. 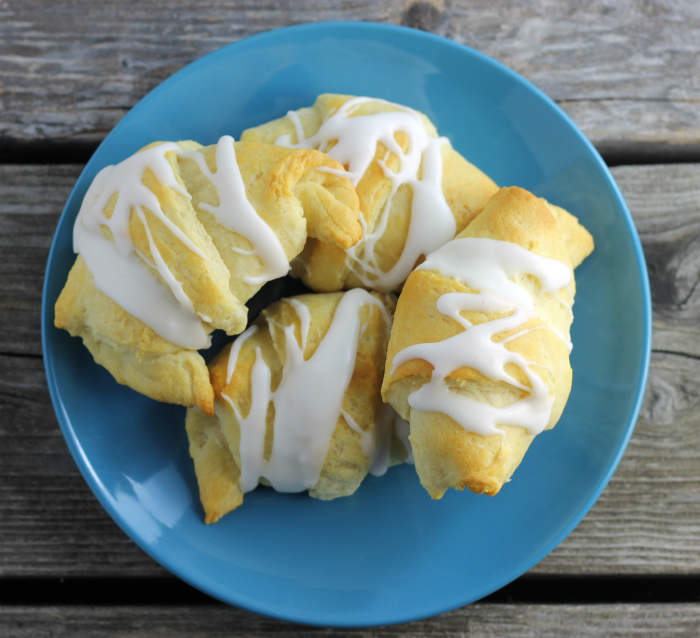 Try these yummy strawberry cream cheese filled crescent rolls, you’ll be happy you did. In a medium bowl add the cream cheese, powdered sugar, and vanilla, with and electric mixer beat until smooth and creamy. Fold in the finely chopped strawberries. Remove the crescent rolls from the can and separate. Divide the cream cheese filling between the 8 rolls. Place the filling on the widest side of the roll, leaving space at the ends. Gently roll up each crescent rolls (I flattened the ends slightly so the filling would not run out). Place on an ungreased baking pan and place in the preheated oven. Bake for 12 to 15 minutes. While the crescent rolls are cooling make the icing. Add the powdered sugar to a small bowl; gradually add the lemon juice until you have proper consistency for drizzling. Beat until smooth. These look tasty. Great idea for dressing up crescent rolls! These sound delicious, what a lovely idea! Sorry to hear about the strudel incident. I’ve been debating tackling a strudel here soon…but you’ve prepared me for a battle! I’ve just always been impressed when I see the videos of stretching strudel dough the length of an entire table. Hmmm…I can only imagine the look on my wife’s face if she walked into the kitchen and I had the entire counter covered in strudel. She’d probably just turn around and walk out. Hah! 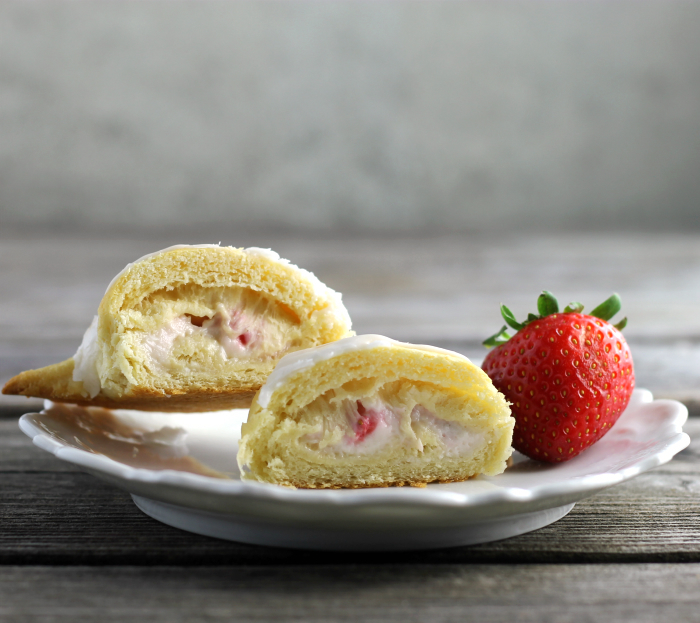 In the meantime, these strawberry cream cheese crescents sound quite wonderful! 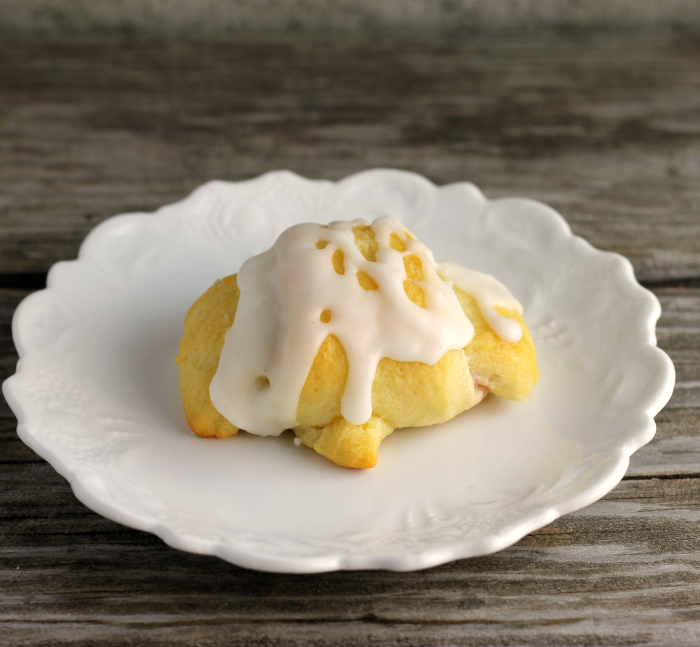 I love strawberry cheese filling…it would be nice to use it in some homemade sweet buns too. Dawn, these just sound and look delicious…I love the combination of strawberry and cream cheese in it…they are delicate. What I like the best? Easy to make them…thanks for the recipe! I can never have enough easy recipes! Particularly ones that look as good as this. Terrific dish — thanks so much. Hi Dawn, I am eating strawberries like there is no tomorrow, love, love this recipe. Morning sweets are the best. Oh my gosh, I love that little plate.